What's happening on the SP 4449? Since Holiday Express the focus has shifted to working on the rail cars. In this photo new paneling is being stained after being installed in the Traveler's Rest. 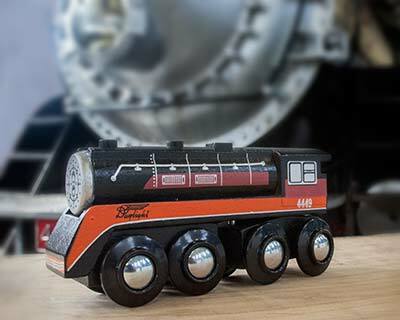 Click here to see more of what the SP 4449 has been up to recently. When can I ride behind the SP 4449? Due to Amtrak Policy Changes no Excursion being Planned for 2019! Due to Amtrak's ban on charter services and special trains there are no excursions being planned for the SP 4449 at this time. 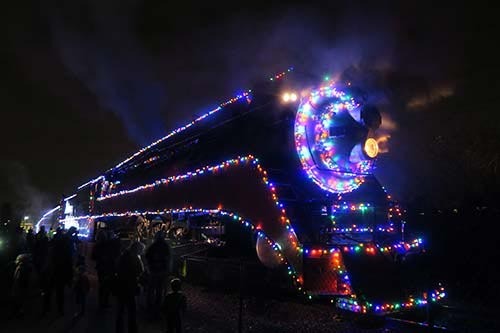 Currently the next opportunity to ride behind the SP 4449 will likely be the ORHF 2019 Holiday Express. Expect tickets to go on sale in October 2019. We will post it here if things change. 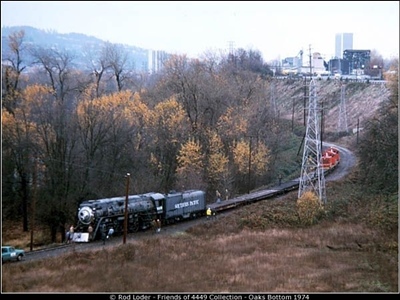 On December 14, 1974, Southern Pacific 4449 was towed out of Oaks Park in southeast Portland, OR. and taken to Burlington Northern's Hoyt Street Roundhouse in what is now the Pearl District. There, the 4449 was disassembled, inspected, repaired, and reassembled to pull the American Freedom Train in 1975-1977, a train full of historic artifacts that toured around the United States. Over the course of 40 years, this steam locomotive and the crew that kept her operational has continued to pull officer specials for railroads, star in a Disney film, run excursion trains for the public, and return to Oaks Park during Holiday Express events. Some of the same crew members who took part of the activities in 1974 continues to be involved today with a whole new batch of volunteers working to carry 4449 into the next generation. Come see the SP 4449 at the Oregon Rail Heritage Center located at 2250 SE Water Ave, Portland, OR. Now is a good time to visit! For those taking transit, the MAX orange line passes right by the front gate. See MAX and Streetcar websites for more information. Heritage Center hours are 1-5 PM Thursdays and Fridays, 12-5 Saturdays and Sundays. There is no charge to enter the facility, but your support at the donation box or concessions shop is much appreciated!